His Lordship, Bishop Godfrey Mary Paul Okoye, C.S.Sp., was born to a noble family of Nwazulu Okoye and as a sickly child on 19th December, 1915, at his home town Ifitte-Ukpo now known as Ifitte-Dunu in Anambra State of Nigeria. He was the last of 8 children of his mother. His father Nwazulu Okoye was a man of outstanding moral and intellectual intergrity who championed the cause of truth and justice in his locality. The qualities of his outspoken and eloquent father were impressed on the young Godfrey. Thus he had extra-ordinary wisdom, which is described as “infused knowledge” by one of our indigenous Archbishops. The Irish Holy Ghost Missionaries saw this in him, and Father Liddane of Adazi Parish where Godfrey Okoye attended his primary school, offered him a teaching post immediately after his standard six in 1931, which he passed in a record time with flying colours displaying unique brilliance and moral conduct. By this teaching post he became both an officially recognised teacher in the colonial administrative settings as well as a missionary and part of the pioneer evangelisation process in Eastern Nigeria. It was during these years as pupil Teacher from 1931 – 1935 that he manifested his leadership qualities, and acquired the apostolic zeal that became the hallmark of his entire ministry. His experiences during his pioneering teaching job welled-up in him the resolve to dedicate himself to God as a catholic Priest. Okoye was ordained a diocesan priest on 27th July, 1947 and this became the crowning moment of his entire life. By his ordination, he became one of the pioneer indigenous priests of the Igbo People. He was equally an eloquent testimony to the future indigenous aspirants to the priesthood and religious life. His first Parish work as a priest was at Elele. He lived, until his death in 1977, with an intense, obsession about the dignity of the Priesthood, which he described in his book, the glories of the Priesthood, as the greatest honour God can confer on a mortal man. He always appeared in his full regalia, in his office and saw himself as the “alter Christus”. His entire personality portrayed him as “man of God and man of the church.” In the Episcopal Conference, his brother bishops all called him “man of the Church”. Consumed with the desire to become a religious priest in order to offer his entire life to God in a more intimate union with Christ, he joined the Holy Ghost Fathers. He entered Novitiate in 1950 and did his First Religious Profession in 1951, all in Ireland, and thus became the 1st West African member of the Congregation. He wanted to become a Monk but God had other plans for him. He returned to Nigeria and was posted the Parish Priest of St. Martin’s, Ihiala from 1952-1958. He later became the Rector of All Hallows Junior Seminary, Onitsha and eventually elected the first Bishop of Port Harcourt Diocese. He was consecrated and installed the Bishop of Port Harcourt Diocese on 3rd September, 1961. Thereby becoming the 2nd indigenous Bishop in West Africa. Barely seven years in Port Harcourt, the Nigeria/Biafra civil war broke out and when Port Harcourt was capitulated he was rendered a Bishop without a seat. He had to take refuge in any parish where the priest welcomed him and this made him have the liberty of focusing on the needs of the time. He served as a roving ambassador for the Church and the people. He was very instrumental in getting the Caritas International Relief Agency and the World Council of Churches to bring relief materials of food and clothing to meet the basic needs of the suffering Biafran refugees and citizens. By Divine intervention, it was in the midst of this most agonizing suffering war, in a refugee condition at Ukpor a town in the Onitsha Archdiocese then, but now in Nnewi diocese that he founded the religious congregation of the Daughters of Divine Love in 1969. Bishop Okoye was a man so full of love and so large hearted that he had a burning desire to spread this love of God and diffuse it to the four corners of the earth. His participation at the Second Vatican Council (1962-65) deepened he desire to found a new congregation whose major task would be to imbibe the spirit of the Second Vatican Council, preach the gospel of God’s love to the ends of the earth in any manner they could do it hence, the non-restrictive nature of the apostolate of the Daughters of Divine Love. The time and place of the foundation of the congregation were God’s own providential design. The founding of the Daughters of Divine Love congregation was not an instantaneous event. 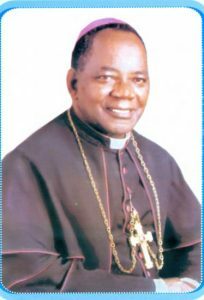 Bishop Okoye went through the due process of seeking the will of God through prayer; it was a long premeditated event which started during the Second Vatican Council and was realised during the civil war. God offered him a perfect opportunity during the war and he took advantage of it. At the end of the civil war in 1970, he was transferred to Enugu, as Bishop of Enugu. He faced many difficulties in Enugu, and died on the 17th March 1977, leaving the the young and undeveloped Congregation of the Daughters Of Divine Love a “confused” orphan. Bishop Godfrey Mary Paul Okoye was a Priest, a Pastor, a Religious, a Teacher, an Educator, a Missionary, a Faith Crusader, a Formator, a Church Leader with unique qualities and “infused Knowledge”, a Trusted Counsellor, a Social Worker, A Visionary Leader, a Peace Crusader, a Founder, and to put all into one brief summary – a man of God, who in imitation of the Master was all things to all men. A man of many parts, a truly integrated but multi-faceted personality. In him humanity and spirituality had emerged and become one, the person and the Priest; the friend and the spiritual guide; the man of the church and the man of the people; our father Founder made God humanly attractive.